Stop and Smell the Chocolates: Wordless Wednesday ~ New Speaking Opportunity? 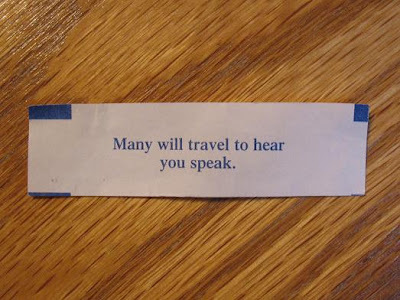 Wordless Wednesday ~ New Speaking Opportunity? This was my fortune from my cookie at a Chinese restaurant last week. For the record, I do NOT believe in fortunes from cookies or anywhere else for that matter. However, this one got me thinking. It must mean that I am going to be asked to speak at a future blogging conference! Right?? LOL! Go check out more fun pics at Wordless Wednesday hosted by 5 Minutes For Mom. I agree, that would be a great conference! But I also think, as Nimmi said, you're already speaking to untold numbers of us out here in bloggyland, and I, for one, am so thankful you're here. You are a tremendous blessing! I hope I could hear you via satellite! LOL. Unless the conference was in Florida!!! BIG Fortune size hugs to you. I hope you get asked to speak. That would be cool. Wow! My fortune cookies are never this direct. I usually have to think about the meaning for a few hours. LOL! People read your blog too, so your fortune is right. I think so my friend! You have lots of great wisdom to share! Let's see... If you're speaking at Blissdom next year, then your topic needs to be about how to frugally attend such conferences via twitter. All of you are such a blessing with your sweet comments!